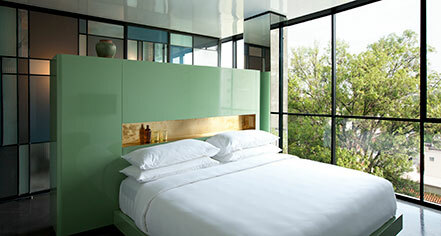 Casa Habita’s modern high rise tower offers 37 luxurious guestrooms and suites, each distinctly merging classic style with contemporary comforts, plus a spectacular Top Suite. Rooms fall into four categories, each with outward-facing windows affording sweeping views and soft natural lighting. 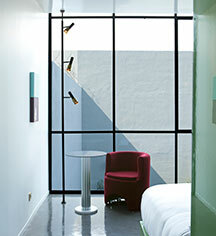 These 27 square meter guestrooms embrace both elegance and simplicity with a king-size bed and outward facing windows. With 28 square meters to relax, these modern guestrooms offer a queen-size bed and a private balcony with views of the historic house and the pool area. These 27 square meter guestrooms have either a king-size bed or two twin-size beds and offer large windows with premium views of the colorful street and its canopy of trees. This spacious 43 square meter suite has a king-size bed and additional sitting space. These rooms offer two walls of large windows, one overlooking the vibrant street, and the other affording views of the patio. The pinnacle of modern style and luxury, this 107 square meter suite provides ample space for relaxing and entertaining. A living room separate from the bedroom features art and furniture, while a private top-floor deck with an outdoor fireplace offers views of the historic house and pool deck. This suite can be reserved for private parties and events.